Intercomp PT 300 Wheel Load Scale Systems (6) 10K PlatformsPT300 scales systems with carry case -- save money by buying a wheel load scale system as a complete package. System includes (6) 10,000 lb. x 5 lb. 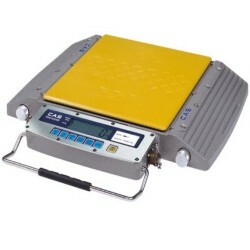 scale platforms with wireless output, handheld wireless weighing indicator with batteries and case, totalizing cable, scale charger and storage case for scale pads. 12" wide platform accommodates single tire (outside tire in dual wheel configuration). Lead time is usually 3-4 weeks. Price includes cont'l US freight! Total Capacity: 60,000 x 5 lbs. CAS RW-10S Portable Wheelweigher 20,000 lbThe CAS RW-10S 20K Capacity Wheel Weighing Scale is designed for mobile weight inspection. Connect up to 6 scales for multi-axle weighing. Ideal for mobile weight inspections and safeguarding against overload weight vehicles. Available in standard version or NTEP version. Ground shipping included for cont'l US customers.